Parking: Coming from Conway follow Route 113 past Madison Elementary School until you reach Burke Field on the right. Coming from Tamworth follow Route 113 until you reach Burke Field on the left. Parking is available in the baseball parking lot. Reaching the Trail: To reach the path, walk up the small hillock between the two baseball fields. Approach the basketball court and continue until you see a small white sign directing you to the nature trail. Follow the arrow to the small ridge on the far side of the sandpit. To the left of the boulder are two green stakes where the trail begins. Markers: The trail is poorly marked, with white arrows at the beginning and end, but none on the rest of the trail. 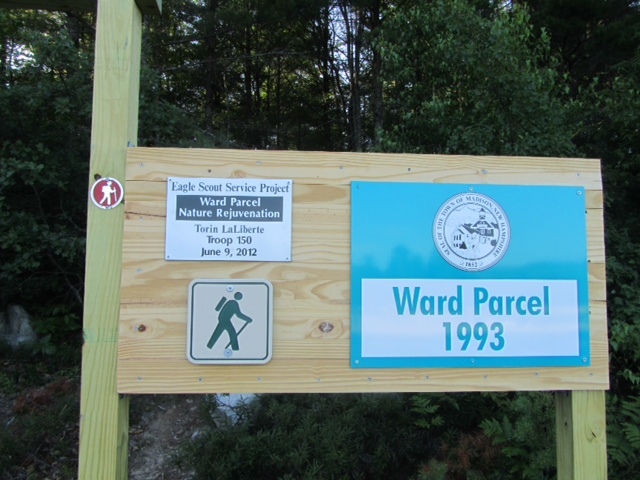 Trail Description: Ward Nature Trail is a shady trail, dominated by a mixed hardwood/softwood forest. On the far side of the trail, the forest becomes a red maple swamp. Terrain: The path is fairly flat with few ups and downs. Condition: A few yards in, the trail reaches a split. The best way to follow the trail is to go to the left. The trail is narrow and difficult to follow, often obscured by leaf cover. On the far end of the trail the ground becomes marshy. At .51 miles, the trail reaches an old road, where the trail goes right. The trail merges with the road for about ___ yards, then the road heads left into the sand pit. The trail goes right, back into the woods. Ward Nature trail ends at the original trail split. Length: Three quarters of a mile. Why don’t someone take it upon them to properly mark the trail. I just walked there on Monday, December 14, 2009. I used snowshoes and I was the first person to travel there since the snowstorm. It was good exercise and I had to keep moving since it was getting dark. The markings were not clear and I’ll bring some marking tape the next time I go. When the trail is broken this is a great snowshoe path. The trees and brook have changed since the summer. I hope to take some novice snowshoers out there in a few weeks. Parking behind the town hall is convenient. I went on snowshoes again in January with two other old timers. It was cold (about 3 degrees) and sunny. It was either the 16th or the 23rd. We kept moving and warm and still stopped to check out trees and tracks and we were back at the vehicles in 45 minutes. During Old Home Week, six year old Joey and I walked the loop around the Ward Parcel. It is a peaceful short hike with a trickle of water in the brook. It’s a quick way to get into the woods for a few minutes. Stay tuned because I hear there might be a maintenance project coming to this trail soon.